MV Loch Dunvegan pictured at the Colintraive slipway. Bute’s community councillors have been asked for their views on a proposed change to the Rhubodach-Colintraive ferry timetable which would see a half-hourly service introduced throughout the week. CalMac Ferries Ltd is consulting on a proposal which would see the 20-minute frequency in the Monday-Friday morning and evening peak hours reduced to 30 minutes from October 26, with departures from Colintraive at 00 and 30 minutes past each hour and from Rhubodach at 10 and 40 minutes past. Mr Richmond says the company would continue to operate additional ‘on demand’ sailings where required by the volume of traffic or the need to restrict capacity while carrying dangerous goods. A half-hourly frequency already applies on the route on Saturdays and Sundays. 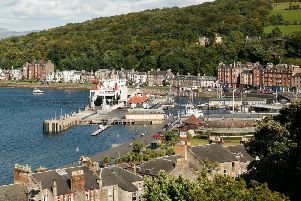 The company has begun talks with Argyll and Bute Council on the impact of the proposal on the bus services linking Rothesay with Portavadie and Dunoon. BCC members have been asked to contribute their views between now and the next community council meeting on September 16.